Hannah Ellsworth is the assistant director for advancement communications at Bentley University. Like most social media professionals, I spend part of my day sifting through news stories, blog posts, twitter chats, webinars and podcasts in a search of the missing ingredient in my social media strategy. It’s easy to find information on ways to better use Facebook analytics, ideas for creative content, and suggestions on how to increase the reach of my tweets, but I feel like Food Network’s Guy Fieri as I struggle to find a little-known eatery that holds the key to LinkedIn’s secret sauce. Excluding the chatter regarding LinkedIn’s recent redesign, I don’t think we talk about LinkedIn enough. 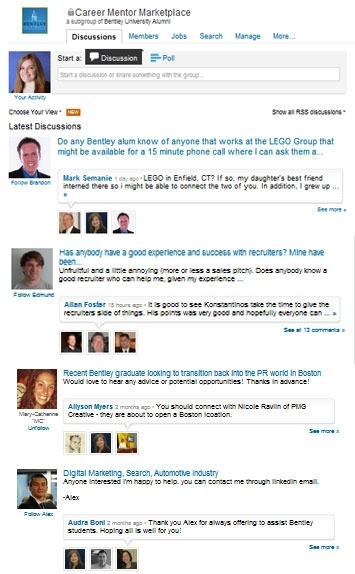 In the more than two years that I have managed social media accounts for Bentley University’s alumni, I have found our LinkedIn group to easily be our most popular online community, our plat du jour. The group has become a resource for thousands of alumni. It acts as an alumni directory, a networking venue and is an asset for job-seekers and employers. Quite simply, it’s a great spot for our alumni and current students to connect. While I can attribute the group’s success to a few key factors—the most obvious is that Bentley is a business school—I was at a stand-still when it came to harnessing the power of this group. Sure, I source data for our alumni magazine and give leads, send updated contact information to the information services team and contribute to and monitor our discussion and job boards. But for quite a while, I was simply stumped when it came to taking the next step with this enthusiastic online community. following of almost 1,000 community members, far exceeding our expectations. The subgroup has empowered alumni to give back by developing meaningful relationships with students and their peers on a schedule that is convenient to a working professional’s busy life. Building the subgroup has been like finding that tiny café around the corner. It’s a hidden gem, with a loyal following, that serves the best lattes in town. Just a few weeks ago, I met a young alumna at a Red Sox game. I started to tout my usual spiel, encouraging her to follow us on social media. At the mention of LinkedIn, she cut me off to tell me about her success with the Mentor Marketplace. Through the group, she had already met with another alumna, who is more established in her field, on three occasions. Over coffee, these alumni discussed industry insights, job prospects and career development. Moral of the story: I may have been looking for a secret ingredient, but sometimes the most basic flavor can give a recipe the right kick. My search for innovation in LinkedIn group management continues, but for now, the creation of a simple subgroup has led me one step closer to perfecting my social media plat du jour. Hi Andy, a colleague put together a prezi that outlines the benefits of the subgroup for our alumni and students: http://bit.ly/PFPQ0t. Hannah, great example of something simple turning out to be an appropriate solution. Sometimes we over-estimate the complexity that is needed to overcome a given challenge. I have a question about the effort you describe here: Would you be willing to share with us the description (if any) in which you describe the subgroup’s intended purpose to your audience? Thanks!